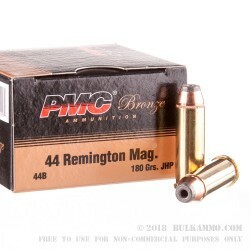 A versatile, fast round for your tried and true .44 Remington magnum. 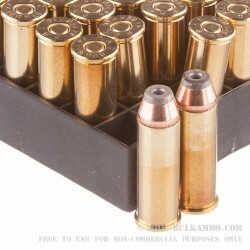 This 180 grain semi jacketed hollow point load is generally accepted as a great alternative to the very heavy 240 grain load. This is for situations where you want a bit less recoil or you want a bit more velocity and penetration. The round is suitable for use in hunting scenarios where medium game like hogs are the target. While it can easily be used for deer and other larger game it is better suited to moderately sized game in the field, or for rang shooting purposes. 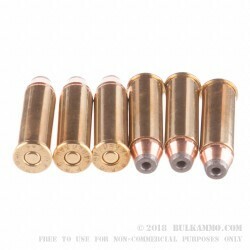 A great bulk discount is available for these speedy bullets and the price point is already very good. 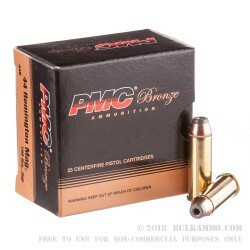 Part of these PMC value line of reloadable brass cartridges, these rounds can be expected to achieve velocities of about 1750 and giving 1225 ft. lbs. of energy at the muzzle. As a self-defense choice these are capable of extreme penetration and offer enough lead on target to be a viable threat stopper for any realistic threat. The extreme velocity and the highly deforming semi-jacketed hollow points, while straight out of the “Dirty Harry” era, are still obvious performers when compared to any of its peers for personal protection.